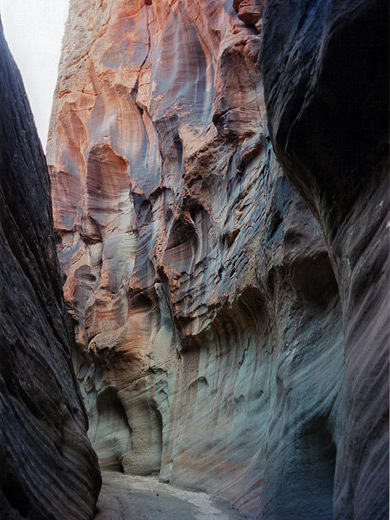 Mineral Gulch is a distant, secluded canyon, just one of hundreds of narrow gorges in south Utah. 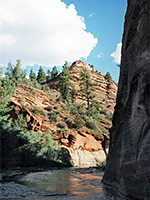 It is a tributary of the East Fork of the Virgin River, which after the confluence flows through its own deep canyon (Parunuweap) and joins with the West Fork - the river responsible for creating Zion Canyon. 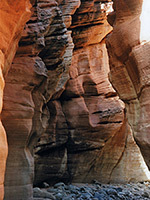 The lower one mile of the gulch has several lengthy deep, narrow passages enclosed by high red Navajo sandstone cliffs, with patterns of light and erosion similar to those of Buckskin Gulch. Reaching the canyon takes some effort - a 3 hour walk along a rough track, down a dry streambed for a half a mile then a climb down a steep cliff, but the complete solitude and unspoilt surroundings are well worth the trouble. Mineral Gulch may be approached from several places, but there is only one route that does not require overnight backpacking. The closest paved road is UT 9 - the dramatic, twisting highway between Mt. Carmel Junction and Zion National Park. An unpaved, unsignposted track leaves the south side of the road between mileposts 47 and 48 (quite close to 47), crosses a small field, leads up a hill and into some woodland, past one newly built residence, then continues southwards through the trees for 7 miles, to within sight of the Virgin River a little way west of the junction with Mineral Gulch. The route is testing for 4WD vehicles for the last 3 miles or so, and after only 1.4 miles the track drops into a ravine, via a section too steep and rocky for 2WD cars. Even before this parts of the track become muddy when wet and may then be impassable. There is a designated camping area with several tables and fire rings just before the rocky section - a peaceful place to stay and high enough to enjoy views across the tree-covered East Fork valley, and far beyond to the White Cliffs in Arizona. Past the campsite, the track bends to the east and crosses down and up the rocky ravine then soon after turns back south and is straight for two rather monotonous miles. The surface is sandy, sometimes deeply rutted, with endless pine trees at either side and only occasional views of the wider landscape. After the straight section the route leads past another primitive campsite, down into a ravine and along a dry, boulder-strewn streambed, then curves west up a sandy hillside to the edge of a deep, wide canyon - quite a dramatic sight, and one which gives an indication that there is some distance still to go. Descending from the canyon edge, the track becomes particularly steep and uneven, curving down and around the cliffs, sometimes with a sheer drop very close to one side. Another 30 minutes brisk walking is needed before the track reaches the canyon floor, where it runs alongside a streambed, which leads to the gulch. Two miles west of here lies Poverty Wash, another excellent slot canyon. 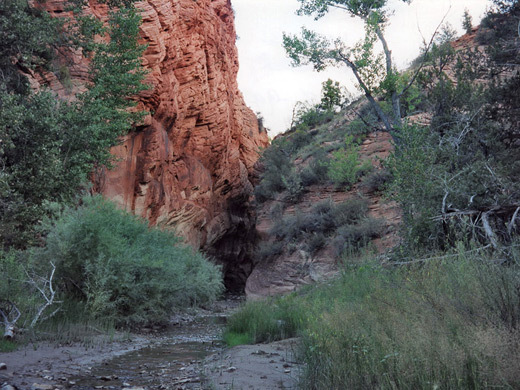 No permit is needed to explore Mineral Gulch, but restrictions to apply to the East Fork of the Virgin River canyon, and this is closed to all exploration past the Zion National Park boundary. 12 views of Mineral Gulch. TopoQuest topographic map of Mineral Gulch. 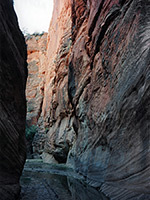 The approach to Mineral Gulch is along the streambed close to the side of the track - a half mile walk over sand and slickrock along a shallow, twisting ravine which has several short drops before the main canyon. The cliffs at the junction are too steep to climb down, but there is an entry point a short distance upstream where a diagonal fault extends right down to the canyon floor. In one place the roots of a tree aid in descending a sheer drop of 15 feet or so. Downstream the eroded, rather forbidding walls close in abruptly and the gulch is very narrow and quite dark for a few hundred yards, then has several alternating shady passages separated by more open areas where the cliffs become less steep, with sandbanks, trees and bushes. A gentle stream with clear water flows through the lower end of the canyon and joins the fast, muddy waters of the Virgin River at the confluence, where patches of quicksand may cause a few problems. 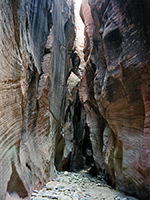 At this point, the river valley (the upper end of Parunuweap Canyon) is wide with sloping walls, and remains so downstream for another 2 miles before deepening - it eventually forms a long section of narrows known as The Barracks, extending into Zion National Park.